Day 2 of the Summer Hoops Festival set the bar very high. A total of 36 games were played today in front of a large gathering of college coaches from all levels. The vast majority of games were very competitive and some new players introduced themselves to the basketball cognoscenti. There were several games to choose from in this category. The day got off to a great start with a highly competitive contest between Thunderstruck and E1T1 in the 16U division with E1T1 pulling out a two point win, 78-76. Later in the day, Team AutoNation out of South Florida took on Team Thrill out of Maryland and the Under Armor Association. The game was back and forth the entire time but AutoNation pulled out a 67-64 win. Nike ProSkills, a Texas-based team in the EYBL had a pair of tight tussles today. The first one found them up by just two with 1:30 left to play against the Florida Sons. They were able to hold them off to win by the score of 66-60. However, it was ProSkills’ second game of the day that turned out to be stellar. Facing Team Breakdown, the contest was a back-and-forth affair the entire contest. With 2:30 left to play, Breakdown led by one at 72-71. Less than a minute later, the score was tied a 74. With just under thirty seconds left, ProSkills’ 2019 guard Justin Webster nailed a three to break the tie. Team Breakdown was unable to score in the closing moments and Nike ProSkills won their second big game of the day, 77-74. 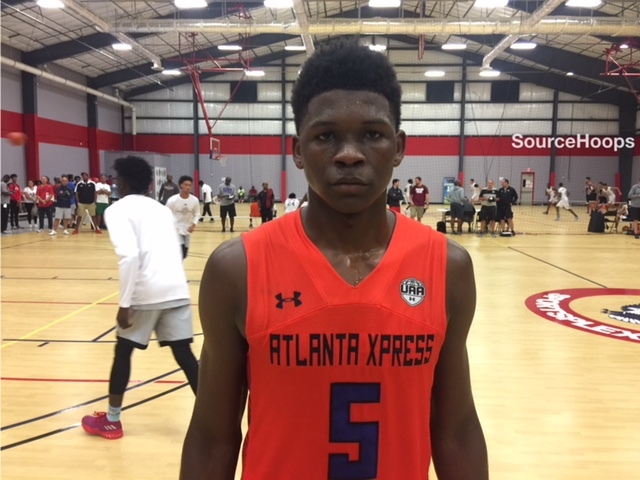 While it may not have been a high scoring day for Anthony Edwards of the Atlanta Express (19 and 13 points in his two games), it is abundantly clear that the 6’4 rising junior guard is deserving of his top ten status in the Class of 2020. Physically he’ got the entire package: good size, strength, length, and athleticism. Skill-wise it is all there as well. He excels at quickly creating separation from the defense to either drive to the basket or get off his jumper. Edwards has the court vision, ball skills, and passing ability to play the point guard spot at the high major level, and possibly beyond. If one wanted to quibble about his play today, it was that he didn’t finish well in traffic at the basket. In fairness, Edwards drew a lot of contact that wasn’t called and most likely he was trying more to earn a trip to the foul line than making the basket. There is a possibility he could re-class up to the 2019 Class. No matter what year he decides to leave high school, Edwards will be a desired commodity by the elite of college basketball. We head back to Nike ProSkills and their 2019 guard Justin Webster. The 6’3 rising senior has a tremendous bloodline as his father, the Head Coach of ProSkills, was a standout at the University of Oklahoma a couple of decades ago. Dad has taught his son well, as he is a knockdown shooter from just about anywhere on the court. Webster surprised a bit with his ability to put the ball on the floor to score as well, finding seams in the defense where none appeared to be found. Defensively, he anticipates well and while not a spectacular athlete, he is more than good enough. In this day when knocking down the three is considered a paramount skill, Webster is one of the best at it. There are a lot of players to choose from in this category, but we continue to be amazed at the high skill level and productivity of Jamal Mashburn, Jr. His ability to knock down shots inside the arc just isn’t found these days. Against ProSkills, Mashburn’s deep jumper found its rhythm, going 4-8 from distance. He’s also has improved his playmaking abilities and looks every bit the part of a high major point guard. Some may knock his size at just over 6’0, but he consistently shows that he can score off the dribble against bigger defenders. Day Three has a lot to live up to! !